Is Zoo College for me? If you are dreaming of a career working with wild animals, the Zoo College is for you. If you are contemplating joining Big Cat Rescue as a volunteer or intern, the Zoo College is for you. If you run a sanctuary or zoo and want all of the best resources and training ideas and materials for your volunteers and staff, then Zoo College is for you and them. How much does Zoo College cost? That depends on you. Zoo College membership is a small monthly fee of $9.00 USD, and you can take the Zoo Keeper course as quickly as you want, which means you can finish the course as quickly as you want. We don’t hold back content, on a drip feed, but we do require that you take the courses in the order they are listed, because many classes build on what you learned in a previous class. Our first several graduates managed to do so in under a month, so the course only cost them $9.00 TOTAL!!! 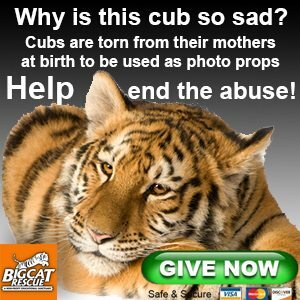 All of your tuition fees support the lions, tigers, leopards, bobcats, servals and other wild cats at Big Cat Rescue. Because all of Big Cat Rescue’s administrative costs are funded by tour revenue, 100% of your tuition helps provide lifetime care for the big cats who have been rescued. How long does Zoo College take? There are 45 lessons. On average each lesson and quiz can be completed in 20-30 minutes so that is about 22 hours of study, not counting all of the extra curricular links to more information. What sort of recognition will I get for completing Zoo College? Each lesson that has a quiz will give you an awesome badge to display on your account page, if you pass the quiz. You must make at least 80% to pass, and you can take the quiz over and over, so do yourself a favor and keep taking it until your badge indicated that you passed with a purr-fect score. At the end of each level you will be presented with a beautiful digital certificate of completion that you can share or print out to frame on your wall, or to put with your resume’. There are some other neat surprises for you as you work your way through the course as well, but we don’t want to spoil it by telling you. Is Zoo College a replacement for on site training at Big Cat Rescue? No. You will have to repeat most of the classes, but you will be much more familiar with the courses, and the repetition will give you a better grasp of the importance of the tasks. Does Zoo College provide me with standard college or university credits toward my degree? At this time Zoo College is not part of any standard college or university degree program. What if I don’t like the Zoo College course? You can cancel any monthly renewal charges at any time. If you paid via Stripe please email me with the email address you used at sign up and I will cancel for you. What Kind of Lessons Can I Expect? These are the lessons for each of the 5 Keeper Levels in the Zoo Keeper course. 1 of 21 How to advance through the Zoo College course. 4 of 21 These are the things you might do on your first day at the zoo. Most other questions are probably answered in our Terms of Service.